If you walk around Allston Village, the neighborhood of Boston where I live, you may notice the graffiti and street art that appears on walls, lampposts, sidewalks, and just about any other public surface. No doubt these contribute to the slightly dumpy feel the neighborhood has, but they also can provide ongoing, dynamic commentary on what it means to live in this particular corner of the city. 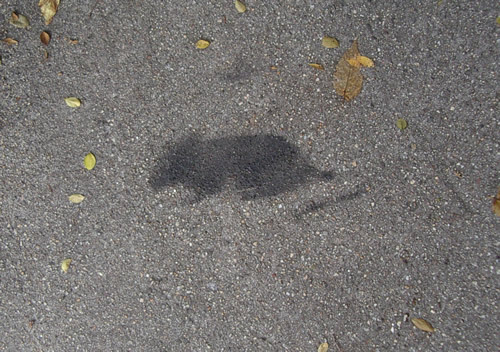 A few days ago, I was walking through my neighborhood and noticed this image of a rat spray painted on the sidewalk. Bizarre, I thought. Why would someone take the time to create a stencil of a rat and then spray-painted it on a random section of sidewalk? Someone clearly has too much time on his or her hands. Or this person’s sense of humor is just absurd enough to make them represent our neighborhood’s rat problem in this form. Noticing this painted rat out of the corner of your eye fairly accurately recreates the experience of having a large rodent sprint across your path on a humid summer evening–a flash of dark movement, a gasp of surprised disgust, a quickening pace, a heightened sense of alertness. But in this case the surprise turns quickly into a chuckle as you realize, with relief, that it’s only an ironic attempt to represent the wildlife inhabiting this corner of the urban landscape. Why is seeing a rat = problem? disgust? If you’re in the forest, you count yourself lucky to see a woodpecker or a deer. You should feel the same way about rats. They are in their natural environment, and they are generally polite and elusive.